on many things randomly and in no particular order: Designing the perfect motorhome or how I stopped worrying and learned to love DIY? Designing the perfect motorhome or how I stopped worrying and learned to love DIY? 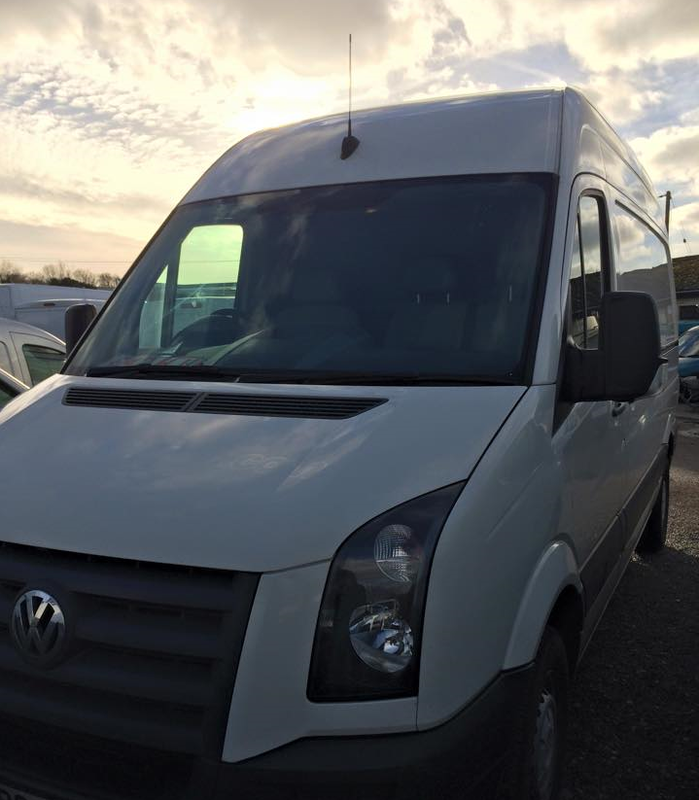 The plan is to convert a standard MWB (that's a technical acronym in the industry for "Medium Wheel Base") Volkswagen Crafter delivery van into a motorhome for general camping and rock climbing all over Europe and possibly beyond. This is the first entry, in a series of many, which are going to document the transformation of an ordinary delivery van into an open plan studio apartment on four wheels. Given the average size of a London bedroom, I feel the preceding statement is fully justified. But enough with the introductions, I've taken liberty of drawing out a boxy design of what the finished internals may look like, should everything go according to plan..
Update 13/05/1015: the next instalment is ready, read it here. So this is basically the day layout of the van, looking from the front towards the back. Permit your imagination to strain a bit, in order to imagine what the night time layout of this modern automotive convenience may look like (hint: that couch looking thing with boxes underneath, folds out into a bed). However to get the maximum understanding of what this is actually going to look like and what all the bits are, you'll need to scroll down.. Given 3D is all the rage these days, i've taken the liberty of including a 3D web viewer. The model has been created with free software called SketchUp Make, which I recommend for projecting/prototyping work. You can even send your designs straight to a 3D printer, should you happen to have one. We won't be 3D printing this one however. As you pan, zoom and fly around the model, you'll see that the web viewer is fairly basic in the functionality it offers. To get the most you'll need to download the SketchUp files and open them locally on your computer. As with most of my projects, the budget has been slowly creeping up. I believe this is due to a phenomenon known as "scope creep". 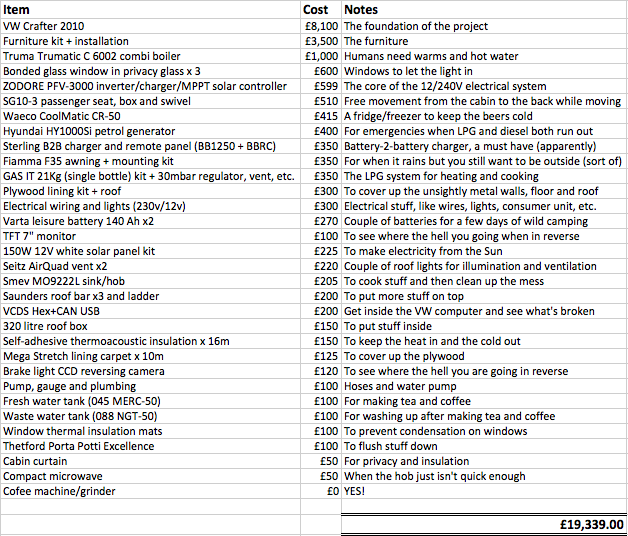 In any case, for budgeting purposes, anything below £20K would be acceptable. I think the above is the minimum amount of kit any self-respecting motorhome should carry. Some things like the generator, awning and roof racks are probably optional of shorter journeys, but will definitely come in useful on longer trips. There will no doubt be sundries I haven't accounted for, but these should not amount to more than £1K, which should still place this project loosely on budget. In the next instalment, if all goes well, we should be fitting windows, insulating and lining the van and installing roof lights, in the comfort of dark, cold Northern European winter evenings and nights (this author also has a day job).